PLANT CHARACTERISTICS: Deciduous, spreading, shrubby perennial. Lacy foliage and delicate fragrant flowers from July to October. Does well in sun or light shade. Attracts butterflies, bees and many other helpful pollinators. Spreads by rhizomes. Should be pruned to 3” after first hard frost. HABIT: It grows wild on rocky limestone hills and slopes in the Guadalupe, Chisos and Davis Mountains in the Trans-Pecos. Most Eupatorium species like moisture, but E. wrightii is more drought tolerant than most, although it may need watering during the summer in dry areas. 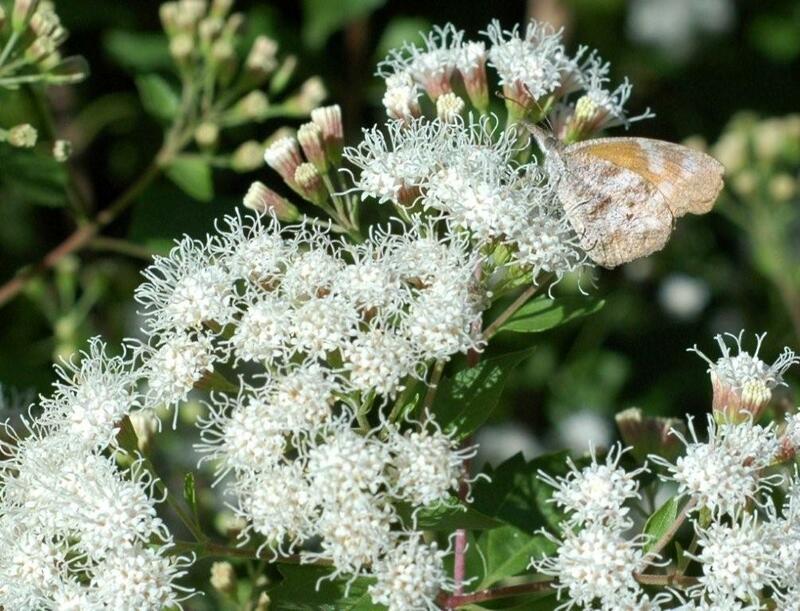 White mistflower's profuse blossoms attract butterflies and hummingbirds. Its small stature makes it most appropriate for gardens and borders. Heavy shearing in the winter will promote a denser shape and more flowers the following year. USE: Garden color, beneficial insect attraction, garden fragrance.